The process of making an anvil is actually rather simple in concept; it just deals with really thick steel in a rather nasty, yet fulfilling, way. Start with a pattern for your anvil. Either trace an existing anvil or design your own. It is possible to get a good pattern from blacksmithing books. Remember that a solid steel anvil can have a very long horn and heel. Next, decide how heavy you want it to be. In general, 4 inch plate yields an anvil of around 180 lbs., if you go by a 1905 Trenton anvil pattern. The length and height of the anvil will vary with the thickness. So 3 inch yields 110 lbs., 5 inch yields 250 lbs., and 6 inch would get up to 350 lbs. A double horn anvil will weigh a bit less since the heel is quite a bit lighter. You will need an oxy-acetylene cutting torch capable of cutting the plate thickness you choose and 2 – 240 cu. Ft. tanks of oxygen. Go to a scrap yard and find a chunk of steel that is big enough for your pattern. Say about 30 inches by 18 inches by 4 inches. If you buy new steel you will pay through the nose. Scrap runs between 10 and 20 cents per pound. New steel costs between 90 cents and $1.50 a pound. Layout your pattern on the steel using soapstone or a white paint marker. To make sure you are cutting the right line it is useful to make up a pattern out of thin plywood. When cutting steel this thick be careful about what you are cutting over. DO NOT cut heavy steel over concrete. The water vapor in the concrete will explode in a cloud of steam, hurling chunks of hot wrought iron slag into the air. It will also spall big chunks out of your floor. Sand, dirt, or a sacrificial piece of steel sheet metal will all work quite well to catch the molten steel. There is a substantial heat output from the process so cover up. It can be done, just be careful. Trust me, I have done a lot of oxygen cutting and I was unprepared for just how nasty cutting 4 inch plate could be. It takes a steady hand and a very regular speed to get a cut that is even remotely nice. This process was so unpleasant that after cutting my first anvil I immediately looked for a company with a computer controlled cutting torch. I decided that if I was going to do this for any one else there was no way I would hand cut another anvil thicker than 2 inch. Check your area for a burning company that will do one of a kind projects. It will cost more to have them rough cut the blank, but will save a lot of trouble. I have found that the price of a cut blank of steel from 3 inch to 6 inch runs about $1.25 – $1.50 per lb. of finished weight. This is out of A36 structural steel. Using a burning shop also allows the use of a computer generated outline. The shop I have dealt with can take the outline as a DXF CAD file. The older shops charge a bit less, but also don’t have computer controlled cutters. Instead, they have an electronic eye that follows a pattern on paper. This can be a simpler solution anyway. It is very helpful to have them burn the top profile of the horn. Also don’t forget to have the feet cut out of a thinner plate, like 1-1/2″ or 2″. This view shows the anvil feet as they were received from the burning shop. After you have the cut blank profile, you have to do a couple of bevel torch cuts by hand to give the shape to the horn. The pritchel hole can be drilled. To create the hardie hole, take 4 small pieces of 1/4 in. plate steel that together form a small tapering box. The interior of this box will be the hardie hole. I make mine with a taper from 1-1/4″ square, at the top, to 1″ square, at the bottom, over a 2″ drop. By making the smallest size of the hole 1″ square, you can make hardie tools by simply welding pieces of 1″ square steel tubing to the bottom of your jigs. Once you have the pieces welded together into a box. Torch cut a hollow in the heel of the anvil that allows the hardie hole box to be placed about 1/4″ proud of the surface of the anvil. Tack weld it in place. Flip the anvil over and back fill around the box till you have completely fused the box to the anvil. If the bottom of the hardie hole isn’t flush with the bottom of the heel, then a short length of 1-1/2″ square steel tubing can be used to extend it. Grind it off flush top and bottom, and everyone will wonder how you cut such a nice square tapering hole in the anvil. It’s up to you if you choose to tell how you did it. The Hardie Hole in the process of being welded into the anvil from the face side. The box is placed so it protrudes through the anvil face by 1/4″. You can drill 1 or 2 pritchel holes, depending on your preferences. I like to have either one hole 3/8″ Dia.. or 2 holes, 5/16″ and 1/2″ diameter. These are drilled so there is about 3/8″ of steel left to the edges of the heel. Pritchel holes are used for punching holes, bending small bar stock, and mounting plates. If the holes get filled with hardfacing it is possible to clean out the hardfacing with a cutting torch from the underside. The Hardie Hole with box installed. Drawing showing the construction of the Hardie Hole Box and the hole cut in the anvil. Be certain to cut enough from the underside of the anvil to allow solid welding of the box throughout the anvil heel. View of the Hardie Hole with most of the filler rod welded around it. Best to do this in a few sessions to allow the machine to cool down. I would estimate that it took at least 3 pounds of rod into the hole gap. This view shows the short length of 1-1/2″ X 1-1/2″ thin wall steel tubing that was used to bring the bottom of the Hardie Hole flush with the bottom of the heel. View showing the tubing welded in and ready for grinding. The Hardie and Pritchel Holes finished. I should have made the Pritchel hole the same way as the Hardie. It is very hard to drill through the hard face – almost impossible. After all the torch work is done, knock off all the slag and scale. Hence beginneth the grinding. Use a large (7″ or 9″) right angle hand grinder to grind the rough shape of the anvil. The better your torch cut was, the less grinding you have to do. Don’t worry about getting a perfect finish yet, just rough out the horn, heel and shelf. By the way, the more slag you chip off the better the ring of the anvil. If there are any really deep gouges from the cutting process, just fill in the holes with MIG weld. Make sure to get a cup style grinding wheel which is designed for aggressive cutting on hard steels. The ones I use are labeled Blue Lightning, and start 7″ diameter and about 1″ thick. They cut very fast even on hardened steel. The Hardie Hole gets a little cleanup on the anvil top, before facing begins. After you have all the rough grinding done, and the hardie hole is installed, you will need to hardface the working faces of the anvil. To do this you will either need a stick welder capable of at least 300 amps or a MIG welder capable of 200-250 amps and able to push 0.045″ wire. 0.045″ is the smallest hard facing wire made due to the difficulty of drawing it any smaller, it being a flux-core type wire. 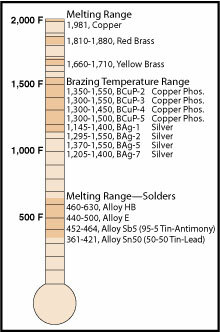 No matter what process you are using you should pick at least 2 alloys. A build up rod that will act as a cushion for the final surface, and the final surface. The buildup rod should have a hardness of at least 42 on the Rockwell C scale (RC42). The final face should be quite a bit harder, like RC54. For reference, most hammer faces are in the range of RC45 to RC55, files run around RC65, and knives range from RC45 to RC58. You will want to lay down weld beads of about 3/4″ wide, with a slight overlap. I cover the top surfaces of the face and horn, as well as going 1-1/2″ down each side. The edges are the hardest parts to build up due to the high amperage of the weld, so many smaller beads will be needed to build these up to the point that they can be ground off to a square edge. First pass of hard facing on the main anvil face. Hard facing completed on the anvil horn and shelf. When hard facing the sides, I go about 1-1/2″ down and run a simple bead to act as a guide. This view shows the completed hard facing of the side and horn side. The edges require considerable build up to allow them to be ground off to a sharp uniform edge. Hardfacing Stick rod can be purchased from UTP, Stoody and Rankin as well as many others. Pick a rod that matches your equipment. You will need to preheat the anvil to 300 to 400 degrees F. This will help to prevent cracking of the hardface due to cooling too fast, as well as aiding penetration. The weapon of choice is a propane weed burner since it can’t get it too hot. To check the temperature you should get a Tempilaque stick. It’s a kind of crayon that can be purchased in sets of temperature ranges. When the crayon melts on contact, you have reached the temp. marked on the stick. I believe you can get these from centaur forge. It is best to lay down a layer of buildup rod on all working faces. It’s not as hard as the true hard facing and acts as a kind of cushion. Also, it’s best not to build the surface too thick too fast. About a 1/8 inch at a time with a thorough cleaning between layers. 1 layer of buildup and 2 layers of hardface should be acceptable for any anvil face. Before you let it cool, you should rough grind the surface to find low spots that can be filled with hardface. Once you have the desired coverage with both the buildup rod and the hardface rod, you should bury the anvil in Lime or Vermiculite to let it cool down slowly. If you are using a MIG welder (my preferred method), you can skip the preheat and slow-cool-down stages since the hard facing wire is much more forgiving, and burns hotter, than the stick rod. Preheating and slow cooling won’t hurt it though. Don’t lay down too much in one place at a time. It’s best to do about 2 layers over the whole surface rather than try to lay it down all at once. MIG hardface wire is a dual-shield process, in that it involves a flux core wire and a shielding gas (75/25 works fine). This does mean that there is a layer of flux that congeals on top of the weld bead. The same 1/8″ at a time applies, cleaning all flux off after each pass. With the Rankin wires, the flux practically leaps off the bead as it cools (very odd to watch). Keep the amperage at around 250 amps, but keep the wire feed down or the weld bead can become contaminated by the flux layer. Keeping the feed down will also boost penetration. If the hardface develops bubbles, you are running the feed too high, and will need to grind out all gas pockets before continuing or they will contaminate each successive layer. Ranomatic DDG, RC56 (56 on the rockwell C scale) ( cobalt with iron carbides). These wires come in 25 lb. and 45 lb. Spools. The UTP, and Stoody wires cost about $6 per lb., but the Rankin wires only cost about $4 per lb. I use BBG for buildup, and DDG for the final surface. Be warned, BBG can be filed, but DDG is too hard to file, so watch out around the hardie hole or you will need a tungsten carbide burr in a die grinder to clean it up. There is also a harder hardfacing wire called TC for Tungsten carbide, it runs about RC65 which is a bit hard for an anvil surface, but may work for some applications. The anvil balanced for work on the heel and cleanup. View showing the finished second pass of the hard facing with more edge buildup. Notice how the hardie hole sticks up through all the hardsurfacing. And the grinding beginneth yet again. Yeah verily. Once the anvil has cooled down, grind, grind, grind and, oh yes, grind some more, until you have the anvil of your dreams. First grinding. The face is only ground enough to show where the low spots are. They are then filled in and ground off again until the face is flat. If you use a cup wheel on a 7 inch or 9 inch Right Angle grinder you will find it easier to get a flat face. You will want a wheel designed for hardened or alloy steels that cuts fast. For the final polishing of the surfaces invest in some “flapper” style sanding wheels of say 40, and 80 grit. On a 4-1/2 inch right angle grinder they are just great for finishing. Another interesting fact is that you can repair pinholes in the final surface with a TIG, using the hardfacing wire as the filler rod. This isn’t really necessary for a smithing anvil, but jewelers’ anvils require a higher degree of surface finish. If you find low spots while grinding, it is much quicker to fill them in with hardface than to grind the whole face down to the lowest points. This shows the TIG welded spots, where I found little air bubbles in the hard faced surface. It usually takes 2 or 3 cycles of welding and grinding to get all the bubbles out. Another option is to weld a hardened steel plate to the surface of the anvil. This can save a lot of time but will not ring as well as a hardfaced anvil surface. Old planer blades would be a source for a hardened steel plate. The only easy way to put it on is to weld it all around the perimeter with good, hot, deep, v-ground welds, while trying to keep the face >from getting too hot by setting a soaking wet towel on top of it. This however doesn’t give you a hardened horn. During the final grinding I like to grind a sharp edge on one side of the face, and a rounded edge on the other edge. The rounded edge goes from a 1/8″ radius to a 1/2″ radius from the heel towards the horn. This allows more options when bending as well as allowing metal to be drawn down over the rounded edge. The Finished anvil face after being polished with a flapper disc. All that is left is to weld on a couple of feet to stabilize it and to mount it to your block and there you have it. So simple and quick ( sarcasm). Really it is a lot of work but you will get a really great anvil and there aren’t too many people who can honestly say they have made a real anvil. Also, don’t forget to mark your anvil for weight and date of manufacture. My trademark is the Norse Rune or tir. It was applied with a MIG. Also shows weight, date and serial number. Soon I hope to start my 350 lb., double-horned beast. This process can also be used to repair an existing anvil. When working on an older anvil, preheat and slow cooling are critical to prevent cracking or separation of the face. It is very important to grind out any cracks or spalled edges to remove any contaminants. If you are dealing with a cast iron surface, I have had some luck with a process called “buttering”. A buttering-pass refers to laying down an intermediate layer on an otherwise unweldable surface. In this case I lay down a layer of high nickel stick welding rod. UTP Econocast 75 (75% nickel) is usually used to weld cast iron pieces together, but it works fine as a buttering layer upon which can be laid a buildup layer and a hardface layer. I can’t guarantee this will work since it depends on the quality of the cast iron base, but it has worked for me. Good luck and watch your toes. Hardfacing wire: BBG(0.045″x2 lbs.) $6.80/lb. Hardfacing wire: DDG(0.045″x2 lbs.) $7.10/lb. 500 lb. Steel blank from steel yard $0.40/lb. 500 steel blank at the scrap yard $0.20/lb. The author: Ernie Leimkuhler is a Union Stagehand, and Blacksmith working in the Seattle area. He specializes in strange projects for the entertainment industry (opera, ballet, theatre, TV, and movies), and architectural detail (pays better, but less fun). If you liked this article, be sure to check out the article on how to build an anvil stand too.